"Vaccine hesitancy" is a concept now frequently used in vaccination discourse. The increased popularity of this concept in both academic and public health circles is challenging previously held perspectives that individual vaccination attitudes and behaviours are a simple dichotomy of accept or reject. 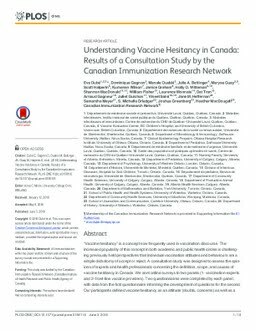 A consultation study was designed to assess the opinions of experts and health professionals concerning the definition, scope, and causes of vaccine hesitancy in Canada. We sent online surveys to two panels (1- vaccination experts and 2- front-line vaccine providers). Two questionnaires were completed by each panel, with data from the first questionnaire informing the development of questions for the second. Our participants defined vaccine hesitancy as an attitude (doubts, concerns) as well as a behaviour (refusing some / many vaccines, delaying vaccination). Our findings also indicate that both vaccine experts and front-line vaccine providers have the perception that vaccine rates have been declining and consider vaccine hesitancy an important issue to address in Canada. Diffusion of negative information online and lack of knowledge about vaccines were identified as the key causes of vaccine hesitancy by the participants. A common understanding of vaccine hesitancy among researchers, public health experts, policy-makers and health care providers will better guide interventions that can more effectively address vaccine hesitancy within Canada.